We designed this convertible business wireless headset series to help you get more done away from your desk phone. With up to 500 feet of range and wide-band audio, our desk phone headsets deliver exceptional sound clarity virtually anywhere in the office. You’ll also love the ability to customize the headset's wearing style depending on your preference. No need to worry about the small details. 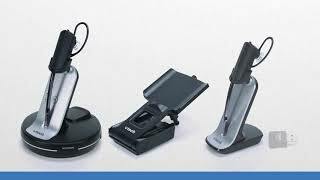 Our office phone headsets work with all brands of business phone desksets. You can also use your VoIP soft phone service to easily place internet-based calls. Stay comfortable throughout the day with three wearing options for your wireless office headset—over-the-ear, over-the-head or behind-the-neck. You can change the style whenever you like. 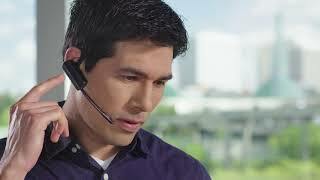 Noise-canceling microphones and DECT 6.0 technology cut down on interference and static on your business phone calls. Wireless headset phone calls have never sounded so rich and life-like. Enjoy high-definition sound on every phone call with your cordless business headset. HD voice and wide-band audio provide crystal-clear communication as you move around your office. Call going longer than expected? A second battery enables you to change the battery mid-conversation for increased talk-time.